Click the Application button and then choose Units from the Drawing Utilities group. The Drawing Units dialog box appears. Choose a linear unit type from the Length Type drop-down list. Choose the type of unit representation that’s appropriate for your work. Engineering and Architectural units are displayed in feet and inches; the other types of units aren’t tied to any particular unit of measurement. You decide whether each unit represents a millimeter, centimeter, meter, inch, foot, or something else. Your choice is much simpler if you’re working in metric: Choose Decimal units. AutoCAD can think in inches! If you’re using Engineering or Architectural units (feet and inches), AutoCAD interprets any distance or coordinate you enter as that many inches. You must use the ’ (apostrophe) character on your keyboard to indicate a number in feet instead of inches. Using the ” symbol to indicate inches isn’t required but is acceptable. From the Length Precision drop-down list, choose the level of precision you want when AutoCAD displays coordinates and linear measurements. The Length Precision setting controls how precisely AutoCAD displays coordinates, distances, and prompts in some dialog boxes. For example, the Coordinates section of the status bar displays the current coordinates of the crosshairs, using the current precision. The linear and angular precision settings affect only AutoCAD’s display of coordinates, distances, and angles on the status bar, in dialog boxes, and in the command line and Dynamic Input tooltip areas. For drawings stored as DWG files, AutoCAD always uses maximum precision to store the locations and sizes of all objects that you draw, regardless of how many decimal places you choose to display in the Drawing Units dialog box. In addition, AutoCAD provides separate settings for controlling the precision of dimension text. Choose an angular unit type from the Angle Type drop-down list. Decimal Degrees and Deg/Min/Sec are the most common choices. The Clockwise check box and the Direction button provide additional angle measurement options, but you’ll rarely need to change the default settings: Unless you’re a land surveyor, measure angles counterclockwise and use east as the 0-degree direction. From the Angle Precision drop-down list, choose the degree of precision you want when AutoCAD displays angular measurements. In the Insertion Scale area, choose the units of measurement for this drawing. Choose your base unit for this drawing — that is, the real-world distance represented by one AutoCAD unit. 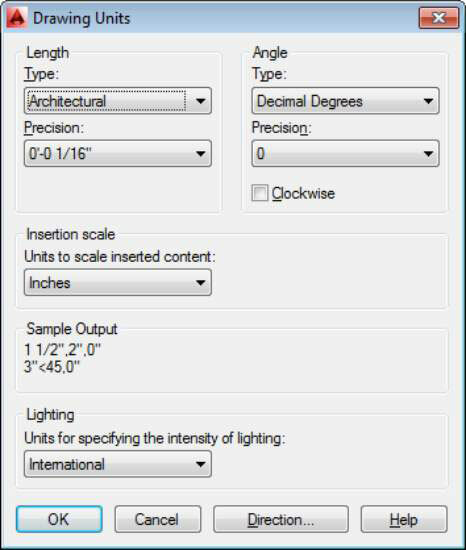 The AutoCAD (but not the AutoCAD LT) Drawing Units dialog box includes a Lighting area where you specify the unit type to be used to measure the intensity of photometric lights. Click OK to exit the dialog box and save your settings.